By Jim Purpura. Posted March 15, 2012, 8:49 PM. 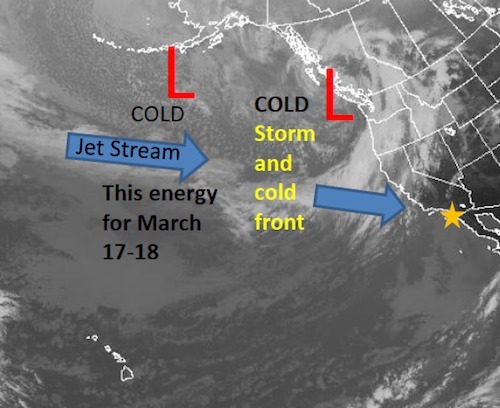 This weekend's incoming storm will be bringing sharply colder temperatures over the weekend, bringing an abrupt end to a couple of cool but otherwise pleasant days. The National Weather Service has been forecasting low snow levels with accumulations of several inches in areas down to 2500 feet elevation, such as the WeatherCurrents station at Beaumont/Cherry Valley. In a forecast update on Thursday, the National Weather Service says that the snow may reach to lower elevations than previously thought. Locations such as Temecula and Murrieta, the Elsinore Valley, the Menifee and Perris Valleys, and the San Jacinto Valley, at elevations of 1100 to 1500 feet, could even be affected. Brandt Maxwell, Meteorologist at the National Weather Service says, "I don't see an accumulation in areas like Temecula, but there is a possibility of brief snow flurries or snow mixed with rain." The best chances of snow would be Sunday morning. The heaviest rainfall will be as the strong cold front moves across the area Saturday afternoon into Saturday evening. The last widespread snow accumulation in the Temecula Valley was November 21, 2004.